Q: Who are Third Eye Blind? Bradley William Hargreaves (b. July 30, 1971, Marin County, Calif.), drums and percussion. Anthony Joseph Fredianelli (b. April 2, 1969, Santa Monica, Calif.), lead guitar and background vocals. Kevin Rene Cadogan (b. Aug. 14, 1970, Oakland, Calif.), lead guitar and background vocals until 2000. Q: How did Third Eye Blind form? A: Third Eye Blind formed as the brainchild of Stephan Jenkins...the group's lead singer, primary songwriter, producer, and periodic musician who was intrigued by the prospect of being a "storyteller" using music as a medium years ago. In the early 1990s, Jenkins was involved in a group called Puck & Natty and a number of other San Francisco music ventures. Fortuitous circumstances brought Jenkins in contact with other musicians, and a band lineup slowly began to form; with several demonstration recordings made. After having already established themselves as a local act, Third Eye Blind opened for Oasis in 1996 to a hugely positive reception, attracting attention from major record companies. The band signed to Elektra Entertainment in June 1996, citing artistic freedom as their choice of the label. The rest, as they say, is history. Q: How has the band lineup changed over time? *Acting tour members; Arion Salazar is supposedly still an official member of the band. Stephan Jenkins has been the only total constant in the band over its decade and a half of existence. Q: What does "Third Eye Blind" mean? Of course, if you ask me, it's just a cool and clever name. Q: Why do people like Third Eye Blind? A: The possibilities are as diverse as they would be for fans of any band: Perhaps they were electrified by a live performance. Perhaps they received a copy of Blue as a gift and couldn't get the catchy melodies or varied instrumental arrangements out of their head. Perhaps they identified with the lyrical themes of "Jumper" or "How's It Going to Be," and the band has had a positive influence on their lives. Regardless of the circumstances, the band's loyal fan base is a testament to fact! Q: What are some of Third Eye Blind's musical influences? Q: What tours have the group engaged in over the years? Q: How can I get concert tickets? A: Typically through a ticket outlet or a venue's box office. Recently, the "Events" page on the official Third Eye Blind website has contained links to allow tickets for specific concerts to be purchased online. Q: How can I get backstage passes? A: Traditionally, backstage passes are reserved for venue employees and crew members, and are sporadically distributed to fans via radio station contests and the like. Back in the old days circa 2000 or so, the band distributed backstage passes to people who maintained fan websites; though it's anyone's guess if anything's become of this policy since. In mid-2009, Third Eye Blind began soliciting volunteers and drawings at concerts for chances to meet the band in person. Q: Were the members of Third Eye Blind involved in music prior to joining the band? A: Prior to the founding of Third Eye Blind, Stephan Jenkins briefly collaborated with Detroit musician Herman Chunn for an ersatz rap/reggae group called Puck & Natty (or Puck & Zen). Although short-lived, the group placed a song on the Beverly Hills, 90210 television soundtrack (Giant/Warner Bros. 24465, 1992) before dissolving. A few Third Eye Blind songs, including "Semi-Charmed Life," started out life as Puck & Natty songs. It's worth noting that Stephan was also involved in an even earlier band called Splash, and played a role in a number of miscellaneous San Francisco music ventures of the early 1990s. Brad Hargreaves was involved with a number of jazz projects; including albums by Vijay Iyer. Arion Salazar and Kevin Cadogan were both involved in numerous minor bands starting in their teenage years. 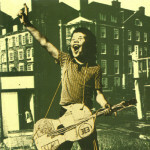 Arion's most prominent pre-3EB stint came in a band called Fungo Mungo, whose debut album Humungous achieved major-label release on Island in 1992. Tony Fredianelli had perhaps the longest and most productive career prior to Third Eye Blind. 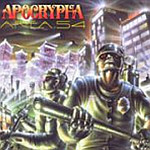 In the late 1980s and early 1990s he was involved in Apocrypha, a metal band that released three albums on the Shrapnel label between 1987 and 1990. A solo album (also on Shrapnel) followed in 1993. Later in the decade Tony was also involved in a cover band called "Love Shack" and a group called Majik Alex; though no records were released. Q: What happened to Kevin Cadogan? A: This tends to be an issue that still proves to be a bone of contention among fans to this day. As the lore goes, after playing a show in Park City, Utah on January 25, 2000, Kevin returned to his hotel room to discover the bill slid under his door and the rest of the band in travel to California without him. The unceremoneous firing supposedly came as a result of a popular vote among the other three band members, and new (and onetime) Third Eye Blind member Tony Fredianelli fulfilled guitar duties in the band from that point on. The issues explaining why a conflict erupted are a bit complicated, and subject to speculation and different accounts. One major factor was evidently one of finance and organization: Kevin had apparently been under the understanding that legal ownership of Third Eye Blind was split between he and Stephan, whereas in reality the various legal entities of the band were associated with Stephan's name only. Conflicts evidently intensified in the lead-up to Blue due to differences over musical direction, unhappiness over Elektra's advance choice of singles, and Kevin's sole veto of a deal agreed to by the other band members in the wake of the "Slow Motion" controversy whereby they received a cash advance, EP deal, and the prospect of a vanity imprint in return for censoring the song.3 Due to the circumstances over his termination, Cadogan filed a lawsuit against his former bandmates and other parties involved. An out-of-court settlement was reached in June 2002. Q: What has Kevin Cadogan been doing since 2000? 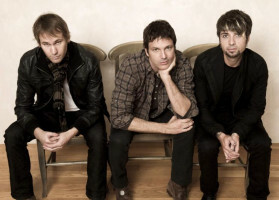 A: Cadogan has been engaged in a number of musical projects since leaving Third Eye Blind. In April 2000, he formed a band called Bully with Adam Johnson and Rob Commer, which soon became known as Cousin Kevin. The group released two limited-production albums, titled Bully For You and Coming Back From Yesterday. The band ultimately dissolved for financial reasons. In April 2007, Cadogan formed a new band called Radio Angel with fellow music veterans Steve Harwell (Smash Mouth) and Eric Stock (Stroke 9). Eric Valentine (who co-produced Third Eye Blind's first album) signed on as producer. Various updates on Kevin's solo and Radio Angel projects are periodically posted on Surfacing Submarine: A Kevin Cadogan site. Q: What side ventures or spin-off projects have other members of Third Eye Blind done since joining the group? Q: What happened to Arion Salazar? A: Arion Salazar began missing some of Third Eye Blind's live shows in early 2006; making his last live appearance during the Florida Music Festival in Orlando on May 18. By August, it became apparent that Arion was not due to return. Although vague theories of "personal struggles" were suggested as the basis for Arion's absence, no official statement has been made. In all certainty, Arion might have tired of the fame, emotional drain, and constant touring schedule of band life and chose for that reason to take an extended sabbatical from the group. Although at this moment the possibility seems unlikely, it is entirely conceivable that Arion may eventually return to Third Eye Blind. Since no replacement bass player has offically been named, current promotional materials present Third Eye Blind as being a three-piece band. Q: Who has filled in for bass since Salazar's departure? A: At the outset of Arion's absence, Leo Kremer of KGB played bass at most shows. At one particular concert, Tony Fredianelli was forced to fill in himself and periodically switch between bass and guitar. Abe Millet of Inviolet Row filled in at select shows early on as well, and by 2009 his dutiful involvement essentially left him as a de facto member of the group. 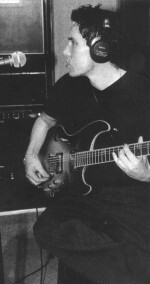 In the studio, Arion's duties have been filled in by session musician Jon Evans, who contributed bass to most tracks on Ursa Major. A: Stephan Jenkins reportedly quit smoking in late 2001. Q: What is "The Boo?" A: The Boo (or Kobuda) is Stephan Jenkins's pet terrier. She actually appears as the black dog in the "Semi-Charmed Life" and "How's It Going to Be" music videos. Q: What is Third Eye Blind's official website? Where has it been located over the years? 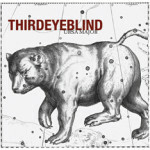 A: Since 1999, Third Eye Blind's official website has been located at www.3eb.com. For a year or two before that the site was located at www.thirdeyeblind.net; a domain that was later reused by a (now-defunct) fansite. In the earliest days, the band's web presence was located at the www.slip.net/~3eb URL. Although this particular site (as well as the ISP it corresponded to) went defunct ages ago, the address remains referenced in the booklet of the self-titled CD to this day. In November 2008, rights were finally secured to the www.thirdeyeblind.com domain. When the current, interactive official website went live the following year, both the 3eb.com and thirdeyeblind.com URLs began pointing to the same site. Q: Why does Third Eye Blind have a presence on MySpace when they already have a normal website? A: Third Eye Blind have had an official presence on MySpace since 2005. In spite of its obvious setbacks (clunkiness, eye-splitting designs, ownership by Rupert Murdoch, etc. ), the site served a convenient, penetrative niche at the time for sharing real-time news, updates, and multimedia with fans. The band's web presence has since been supplemented by an official Facebook page (and since then, by an interactive official website); however, all these various fronts of web content remain maintained online. Q: Is there a good source of up-to-date Third Eye Blind information online? The Third Eye Blind Official Website. Third Eye Blind on Facebook. Third Eye Blind on MySpace. Q: What label(s) have Third Eye Blind been signed to? A: Third Eye Blind signed to Elektra Entertainment in June 1996; remaining on the label through the Out of the Vein era of their career. The stability of their contract, however, was only as good as the stability of the label they were signed to: In March 2004 the Warner Music Group was spun off from AOL Time Warner into its own entity, and its Elektra and Atlantic label units were merged. Two months later Third Eye Blind were released from their contract, along with 85 other WMG artists. Stephan Jenkins later explained that Elektra had been in the midst of "imploding" in the lead up to then, and the lack of promotion for Out of the Vein in the meantime came as an unfortunate consequence. For several years after the upheaval at Warner, the question of how Third Eye Blind's next new release would be issued remained a question mark. By 2008, a distribution contract was secured through Sony Music. Ursa Major will be released in this fashion; on the band's own vanity label. Q: How many album copies have Third Eye Blind sold? Out of the Vein and the Third Eye Blind Collection have yet to go gold; at least by official certification. Q: Why do the Japanese-market versions of Third Eye Blind's albums contain bonus tracks? A: The Japanese-market releases of Third Eye Blind, Blue, and Out of the Vein have the bonus songs "Tattoo of the Sun," "New Girl," and "My Time in Exile" tacked onto the end of their respective track listings. The reasoning for this is actually economic: Due to the strong value of the yen, U.S. record imports can sometimes be acquired in Japan for less than the price of proper Japanese-market releases; so bonus tracks function as a bone of incentive for customers to choose the domestic version. Japanese record issues sometimes contain exacting replicas of LP artwork or other distinctive or deluxe packaging, for much the same reasons. Q: Have demonstration recordings by the band surfaced? A 1993/94 recording containing "Semi-Charmed Life," "Slow Motion," "Wake for Young Souls," "Heroin," "Farther," and "Tattoo of the Sun;"
A 1995 recording containing "Semi-Charmed Life," "How's It Going to Be," "Kiss Goodnight," "Slow Motion," and "Good for You;"
A 1995 Radiant record label demo containing "Kiss Goodnight," "Heroin," "Slow Motion," "Scattered," and "Semi-Charmed Life;"
1999 pre-production tracks for Blue. Bet you didn't know that "Wake for Young Souls" pre-dated the album it eventually saw release on by nearly a decade, did you? Q: Who is Michael Urbano? A: Michael Urbano is a drummer who was involved in Third Eye Blind around 1995; prior to the entrance of Brad Hargreaves. 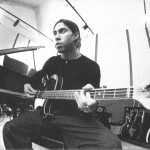 Although his presence in the band was brief, several of the songs for the self-titled album...specifically "Losing a Whole Year," "Narcolepsy," "How's It Going to Be," and "Motorcycle Drive By"...carry musician credits to Urbano; a demonstration of the headtime that was required in recording. Michael Urbano is perhaps better known for being the drummer in the San Jose band Smash Mouth; a position he occupied from 2000 to 2006. Q: What is that stick-figure logo on the back cover? A: The "falling man" symbol actually originates on a set of tarot cards illustrated by Salvador Dali. The "death" card depicts an illustration of a human figure falling from a pointed peak. Upon discovering the image, the band identified the symbol with the concept of Icarus and the prospect, relatable to their music, of "going in different directions at the same time. "5 In blown-up form, the symbol appeared on the packaging to Third Eye Blind and Out of the Vein; as well as some related single sleeves. Q: Why do some copies of Third Eye Blind have a tan cover, while others are red? A: Initial copies of Third Eye Blind (as well as all UK/European issues) have a sepia cover photo with a dark red symbol and lettering. 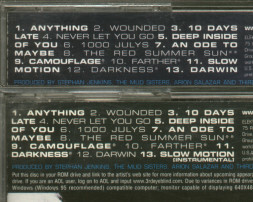 After about half a million copies of the album were printed (probably in summer 1997), the image was changed on North American releases to a red-tinted photo with a yellow symbol and lettering. Supposedly, the color change was made at the band's aesthetic request. Although not rare by any means, the tan-cover version of the album is a popular "blue chip" collectible with fans; namely for presenting the illusion of being a fan of the band longer than one really is. Q: Why does the back cover of Third Eye Blind look familiar? A: Probably because you're old enough to have taste. 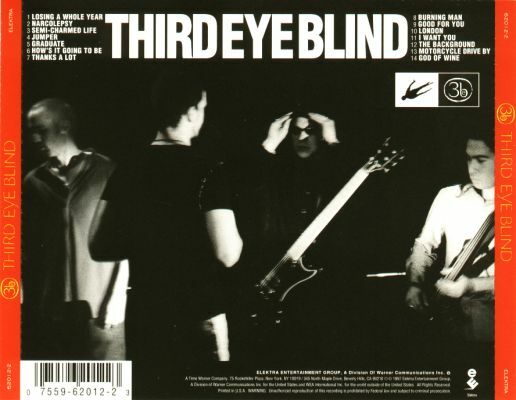 The back cover of Third Eye Blind is a somewhat obvious homage to the Beatles' 1966 album Revolver; with the stark black-and-white photography, typography layout, and even the split logo box arrangement being common between the two. 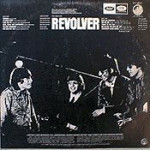 On the U.S. Revolver LP, the box was split to feature a Capitol logo in one half and an EMI logo in the other. On Third Eye Blind, the box was split between the band's "falling man" symbol and "3eb" monogram; the latter of which has appeared (sometimes as an ersatz imprint logo) on virtually every release since. Q: What singles were released from Third Eye Blind? Q: Does "The Background" contain a backward message? Q: How quickly did the Blue album take to record? Q: Why is "Slow Motion" an instrumental song? 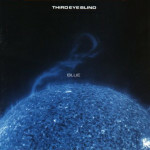 A: Although Third Eye Blind had signed to Elektra in 1996 with the interest of artistic freedom in mind, their creative wishes began to eventually collide with the wishes of the label as Blue neared release three years later. Executives feared that the graphic, topical lyrics of "Slow Motion"—which dealt with the desensitizing implications of domestic violence, drug abuse, and ghetto crime—would spark too much controversy in the wake of the Columbine school shooting and present the band as a scapegoat among social conservatives for the supposed ills of society.6 After initially pressuring the band to omit the anti-violence song from the album's track listing entirely, a "compromise" was reached whereby the band received a cash advance, EP deal, and a prospect of a vanity imprint; and "Slow Motion" was presented in a tamer, instrumental version. Q: How many different versions of the song "Slow Motion" exist? A: At least three; all of which saw release on various incarnations of Blue worldwide. The original, vocal version was released intact on the European release of the album (Elektra 7559-62415-2); even though the booklet references it as an instrumental song. Original U.S. releases (with "RE-1" in the matrix) contained a "semi-instrumental" mix of the song that retained the chorus but no other lyrics. The master for the Blue album was modified again by 2000, in which the track listing was shuffled to shunt "Slow Motion" to the end and yet another version of the song was unveiled. In addition to being a full instrumental, this "RE-2" version of the song features some notable mix differences as well; namely, the entire song is monaural through the 1:26 point. Q: What are the "secret words never to be printed?" A: The "secret words never to be printed" appear after the bridge of "Camouflage;" as stated in the lyric booklet. The "secret words" are actually a bit of a misnomer, since the only thing that appears in this particular section of the song are a few screams and grunts. Q: What is the "Darwin theory?" A: The "Darwin theory" is a fan-concocted story that the lyrics of "Darwin"..."who skipped the record and who amped what you say," "when the plane takes off," and so on...were intended as a commentary on Kevin Cadogan's reluctance to sign the EP deal and a "warning" of his imminent firing from the band. Q: What singles were released from Blue? Q: Why were no singles from the Blue era on released commercially in the U.S.? A: After "cassingles," 3-inch CDs, and standard-size CD singles failed to reach the penetration and ubiquity that the 45 rpm record once had, recording industry concerns largely attempted in the late 1990s and early 2000s to phase out singles from the American market. Although in the short term this move resulted in a spike in album sales, the strategy backfired as many customers turned to illegal downloading as a means to "acquire" individual songs; largely eliminating the popular expectation for physical product in the process. Singles persisted a bit longer in international markets (where indeed, two singles from Blue saw commercial release), but trends eventually led to such releases becoming little more than curios throughout the world. Q: What songs recorded during the Blue sessions didn't make it to the album? A: The sometimes-circulated 1999 pre-production demonstration recording contains a few songs that didn't make it onto Blue; specifically "Gorgeous," "Walking with the Devil," "Scattered," "Separation," "All Right Caroline," and "Sorry." It is, however, likely that few of these songs survived into incarnations of full production tracks. Q: What happened during the band's "gap" in activity between Blue and before Out of the Vein? A: After four years of near-continuous radio airplay and touring, Third Eye Blind took much of 2001 "off," participating in side projects and playing at only a few charity events. After fending off these and other preoccupations (namely, Kevin's lawsuit), the band returned to the studio; punctuated by a summer tour co-headlining with the Goo Goo Dolls. Although initially slated for release in summer 2002, delays held up release of the album (eventually titled Out of the Vein) until May 2003. Q: What and where is Mourningwood Studios? A: Mourningwood was the name of Third Eye Blind's self-built recording studio in San Francisco, where the majority of recording for Out of the Vein was completed. The studio interior was extensively featured in a March 16, 2002 episode of Audio File on the (now-defunct) cable channel TechTV, and was also depicted in the "Hiding Out" DVD. Q: What singles were released from Out of the Vein? Q: Who is Kimya Dawson? A: Kimya Dawson is a female vocalist and songwriter who contributed background vocals to the Out of the Vein track "Self Righteous." Since 2001 she has released several recordings on the independent Rough Trade, Important, and K Records labels; both solo and with a group called the Moldy Peaches. In 2007, Dawson contributed six songs to the soundtrack of the motion picture Juno. Q: What songs recorded during the Out of the Vein sessions didn't make it to the album? A: Among the lesser-known songs that surfaced during the Out of the Vein sessions were "All Right Caroline," "Animal," "Carnival Barker," "Knife in the Water," "A Little More Courageous," "A Man About to Die," "Messed Up Kid," "Now I Don't Know," "Persephone," and "Scattered;" plus "My Time in Exile," which did see release as a Japanese bonus track and as a backing song on the "Hiding Out" DVD. Several tracks were slated for the unreleased Symphony of Decay EP. "Misfits" was originally intended as a collaboration with Fred Durst of Limp Bizkit; although fortunately, this venture did not come to fruition. "Scattered" and "All Right Caroline" made appearances during the Blue sessions as well. "Persephone" and "Carnival Barker" were later freely released as legit MP3s from Third Eye Blind's website. Q: What is "Hiding Out?" A: "Hiding Out" is the title of a short (21:54), region-free DVD compilation of brief concert clips, studio footage, and entertaining commentary with the band. It was included as a limited-edition bonus with initial copies of Out of the Vein (Elektra cat. nos. 62783-2 and 62885-2). Q: Was Ursa Major originally slated to carry a different title? A: Yes. Until 2008, the title for the work was speculated as being The Hideous Strength; after C.S. Lewis' book. This move wasn't without precedent. Nearly all of Third Eye Blind's studio releases changed title somewhere along the way in the midst of production: Out of the Vein was originally slated to be titled Crystal Baller after the song of the same name, while Blue was nearly titled Sunburn before the name was changed to prevent confusion with a then-recent Fuel album by the same name. 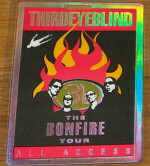 In spite of this, artwork bearing the title "Sunburn" on the spine is visible in a 1999 Third Eye Blind merchandise catalog. Q: What is Third Eye Blind's current label status? A: Third Eye Blind's new and future output as of 2009 will be released on their own vanity label ("Mega Collider Records") through distribution by Sony Music's RED subsidiary. Ursa Major was released in this fashion on August 17, with the catalog number "TEB01." Q: What songs are included on Ursa Major? What themes are the album about? A: The following track listing was finalized a number of weeks before the album's release: "Can You Take Me" / "Don't Believe a Word" / "Bonfire" / "A Sharp Knife" / "One in Ten" / "About to Break" / "Summer Town" / "Why Can't You Be" / "Water Landing" / "Dao of St. Paul" / "Monotov's Private Opera" / "Carnival Barker." "Don't Believe a Word" was released for advance radio airplay on June 5, 2009. Q: Why did Ursa Major take so long to be released? A: It was most likely a mix of different factors. The dissolusion of Elektra as a label left the band without massive backing or induced deadlines for an album. Stephan Jenkins was reportedly struck by writer's block, and took some time off for "soul-searching" and side ventures such as his production of Vanessa Carlton's Harmonium album in 2004. A few other complications; such as the closure of Mourningwood studios and the departure of Arion Salazar from day-to-day band duties, no doubt had an effect on the extended wait as well. In spite of these setbacks, gradual progress at recording was made from early 2005 on. Q: Did Arion Salazar record on Ursa Major? A: Arion contributed bass and horns to "Bonfire," the album's third sequential track. Session player Jon Evans contributed bass elsewhere on Ursa Major. Q: Who is Ari Ingber? A: Ari Ingber is a songwriter, singer, and guitarist in a band called the Upwelling. Jenkins and Ingber first met in 2005, and co-wrote "About to Break" together for Ursa Major. In addition to this songwriting collaboration, the Upwelling have opened for Third Eye Blind at a number of shows. Q: Why is "Carnival Barker" an instrumental song? A: A 1:22 fragment of "Carnival Barker" appears on Ursa Major as an instrumental coda bringing the album to a close. The song has a fairly long history: It surfaced during the recording sessions for Out of the Vein in 2002, and was slated for inclusion on the aborted "Symphony of Decay" EP a year later. This seven-minute instrumental song was later "released" as a free MP3 on Third Eye Blind's website. In the lead-up to Ursa Major, there was conflicting speculation over what incarnation of the song would be included and whether or not it would be an instrumental track. An instrumental version was ultimately chosen because Stephan Jenkins was dissatisfied with his delivery of the lyrics he had ultimately penned for the song.9 A full-length lyrical version of "Carnival Barker" is currently slated for inclusion on the band's forthcoming companion Ursa Minor release. Q: Wasn't an EP supposed to come out some time in 2000, 2003, or 2004? A: The story of the "Third Eye Blind EP" is a saga intertwined with nearly ten years and numerous label-side shenanigans. The seeds of an EP trace back to the "Slow Motion" controversy in 1999. In exchange for not including the vocal version of "Slow Motion" on Blue, Third Eye Blind were presented with an opportunity to include the song instead on a short-length release; paired with additional vocal and instrumental tracks.6 Tentatively referred to as Black, the EP was originally slated for release in late 2000; however, the band was dissuaded from returning to the studio so soon after the arduous recording sessions for Blue, and the record was never finished or released as such. The possibility of an EP was floated once again in 2003 following the release of Out of the Vein; by which point the disc had earned the de facto title of Symphony of Decay. In addition to "Slow Motion," the tracks slated for this record included "All Right Caroline," "Animal," "Carnival Barker," "Knife in the Water," and "My Time in Exile." Unfortunately, the ongoing "implosion" of Elektra resulted in the label rejecting the initial incarnation of the EP and ceasing to exist before any product was actually put out. "My Time in Exile" and the vocal version of "Slow Motion" would ultimately see U.S. release on the Collection compilation in 2006. Q: Have Third Eye Blind released any DVDs of music videos or concert footage? A: Not yet. A DVD music video compilation was originally slated for inclusion with the Collection compilation in 2006, but was scuttled at the last minute. A live DVD of the March 2007 Fillmore shows (televised on HDNet as "Ten Years Down") is another proposal that's been tensely awaited by fans; although nothing has come of it yet. Q: What is Ursa Minor? A: Ursa Minor is an album of miscellaneous studio leftovers and "B-side" type material; complementing Ursa Major and intended for release some time after that record. The track listing has yet to be finalized; however, "All Right Caroline," "Away," "Eyes for You," "In the Skin," "Lay Back," "Now I Don't Know," "Persephone," "Second Born," "Standing Up for You," "Stevie Ray Vaughan," "Swimming," and a vocal version of "Carnival Barker" may be featured. Some of these songs date back to the Out of the Vein sessions or even earlier. Q: What other future projects are in the air? Q: What is "Lost A Whole Year"? A: "Lost A Whole Year" is where you are now...a fan site dedicated to Third Eye Blind, one of my favorite musical artists (and certainly the one with the most profound significance on my life). It is maintained by Andrew Turnbull. "Lost A Whole Year" is, somewhat obviously, a corruption of the 3EB song title "Losing a Whole Year." The website first went live on May 31, 2003; tracing itself to a number of HTML documents I created a year before that. Starting in April 2005, it began to be hosted in a subfolder of my personal website. The site has been maintained since its inception with a text editor; with all HTML (and CSS) coded by hand. Q: Can I submit content for the site? A: Certainly! If you have something interesting, unusual, and Third Eye Blind-related you'd like to contribute to this site, feel free to tell me about it, and I'll see what I can do. Lost A Whole Year, maintained by Andrew, is not affiliated with Third Eye Blind, Elektra Entertainment Group, Atlantic Recording Corporation, Sony Music, or Eric Godtland Management, Inc.
1. Thread: "Adam Carolla recalls Arion's Green Day fight today." The Village Church Yard, 2007. 2. "Hearing the Sky: a Third Eye Blind Bio." 3eb.com, 2009. 3. "Ex-Third Eye Blind Guitarist's Suit Heads To Trial." Billboard magazine, 2002. 4. "Vanessa Carlton: A Pop Princess in Her Living Room." Slant Magazine, 2005. 5. "Chat Transcript with Third Eye Blind." StephanJenkins.com, 2000. 6. "Interview: Third Eye Blind's Arion Salazar." Live Daily, 2000. 7. Thread: "Live CD." 3eb.com, 2009. 8. Chris Duffey-Kevin Cadogan interviews. The 3EB Archive, 2006. 9. Stephan Jenkins’s Blog: Carnival Barker. 3eb.com, 2009. Last update August 21, 2009.